The Wesleyan courts were abuzz this Sunday, April 9, as No. 8 men’s tennis rolled to a statement 6-3 win over No. 9 Williams. It even seemed that the half-marathoners ambling down Vine St. picked up their pace, finding inspiration from the Red and Black’s infectious energy. “Who wants it most, Wes?” roared Princeton Carter ’20 after putting away a massive overhead in the first set of his win at No. 6 singles, establishing a fervid tone that carried through the rest of the afternoon. Many onlookers were unbridledly excited about the team’s performance, and rightfully so. With the victory, Wesleyan extends its winning streak to seven games following a season-opening loss to No. 2 Claremont-Mudd-Scripps. They are joined by No. 3 Bowdoin and No. 4 Middlebury as the only NESCAC schools who remain undefeated in conference play, establishing a virtual three-way tie atop the standings. “CD’s groundstrokes are on another level today”, noted one Cardinal fan who had the pleasure of watching captain Cam Daniels ’18 cruise to comfortable wins in both singles and doubles. “Steven [Chen ’18] is playing out of his mind,” said another spectator. This assertion was certainly supported not just by Sunday’s results, but by almost all of Chen’s recent performances. Against Williams, Chen and Daniels auspicated Wesleyan’s morning with a fairly routine 8-5 win, earning the home team’s first point of the day at No. 3 doubles. The somewhat undersized duo played to their strengths, often finding themselves locked in long off-serve groundstroke rallies which they were able to parlay into multiple service breaks. At No. 1 singles, Chen muscled his way to a one-set lead before expeditiously closing out the match for a 7-6, 6-0 win. Chen now owns a 6-2 singles record after a recent three-game win streak. He dispatched Hamilton’s Sam Farber 6-3, 6-2 on Sunday, April 2 and then rolled Tyler Barr of No. 21 Massachusetts Institute of Technology two days later, dropping just a pair of games in the process. The junior, in his second season at No. 1 singles, is on pace to repeat his top four regional ranking from last spring. 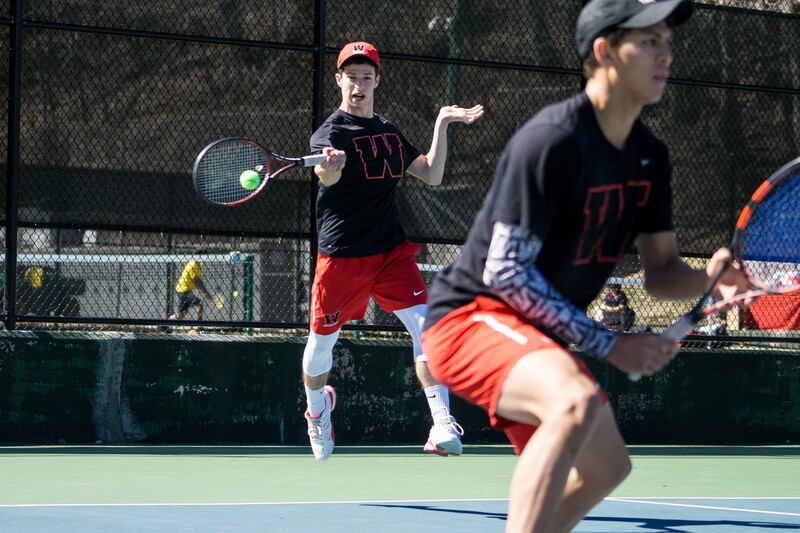 Wesleyan ended the doubles portion of the morning up two matches to one, following a thrilling win at No. 1 doubles from captain Mike Liu ’17 and Jake Roberts ’17. Liu’s fiery on-court persona in contrast with Roberts’ perpetual stoicism gives the impression to some viewers that the pair has compatibility issues, but this perception isn’t particularly corroborated by their results. The tandem has looked sharp while amassing a three-match win streak that has compensated for an up and down start to the season, bringing their record to 5-3. “We have a great time playing with each other, which is why we can communicate so well even when we’re nervous,” said Liu. Chen and Daniels were the first two Cardinals off the court in singles, increasing Wesleyan’s lead to 4-1 and cutting Williams’ margin of error to zero. Straight-set losses from Liu and Tiago Eusebio ’18 kept the Ephs’ hopes temporarily alive, as the attention turned to Carter and Joachim Samson ’19. 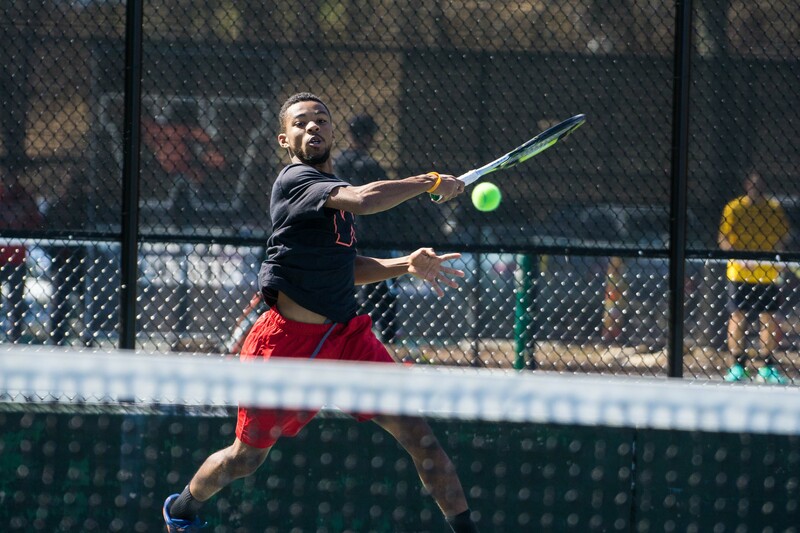 Samson, widely seen as the team’s hardest hitter and an offensive powerhouse, found himself playing a defensive and tactically masterful brand of tennis. By integrating consistency and precision into his naturally powerful play-style, Samson earned a number of forced errors from the baseline, and baited his opponent into unnecessarily aggressive plays that often resulted in unforced errors. After a deceptively close 6-3 win in the first set, Samson never relinquished momentum on his way to a second-set bagel, earning Wesleyan’s fifth point of the day and sealing the victory. Fans migrating toward Carter’s court saw the rookie fall behind in the second set, after he had rattled off five straight games to earn a comeback 7-5 win in the first. Visibly frustrated, Carter mustered just two service holds in the second set, sending the match to a super-tiebreak in lieu of a third set. Feeding off the energy of the crowd and his teammates, Carter sent the fans home happy by authoritatively triumphing in the tiebreak, 10-5. The Williams match was the cherry on top of a week in which Wesleyan went a cumulative 23-4 over three team contests. The Cardinals swept Hamilton despite keeping Liu on the bench to rest. Jonathan Holtzman ’20, slipping into the vacant spot, posted a double-bagel at No. 6 singles for his second collegiate win. The 8-1 romp over MIT was highlighted by Chen’s dominant victory and a sweep in doubles. 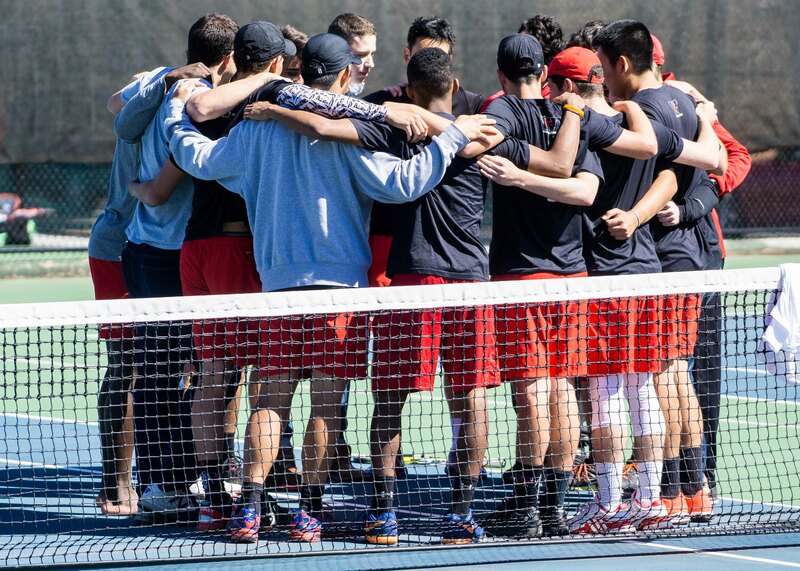 With seven matches left on the schedule, Wesleyan’s out-of-conference schedule is over. They celebrate Senior Day today (April 11) against Conn College in what will be the final match in Middletown for seniors Liu, Roberts, Greg Lyon, and Cam Hicks. The NESCAC schedule will ramp up to an intense final week, where the Dirty Birds face No. 14 Amherst, Middlebury, No. 40 Bates, and Bowdoin over an eight-day stretch. The Argus was able to catch Chen for long enough to discuss the season’s homestretch, the postseason, and more. The Argus: What do you think made the difference between your tight first set and the more lopsided second set? Steven Chen: Personally, I didn’t feel that great in the first set of my match – I don’t know if it was due to nerves or the adjustment to the surface, maybe it was a little of both – but he came out playing great and serving really well, and I also found myself missing a lot more balls than usual. As tennis players, it’s really rare to play our best on any given day and we train to win and compete well even when we’re not playing our best. I tried my best to stay competitive in the first set, controlling what I could control and holding my own service games, and I’m glad I was able to pull out the tiebreaker and carry that momentum through the second set. A: After his match, Mike [Liu] talked about his difficulty with the transition back to playing outdoors. How did you feel like the team adjusted as a whole? SC: We’ve been playing indoors since coming back from our spring break trip in California. Because of the rain and weather the past week, we didn’t get a chance to even practice outside, so it was definitely a big adjustment going from the indoor surface to outdoor hard courts for the first time, and I’m really proud of how everyone stepped up in light of this challenge and got the job done. A: You guys definitely got the job done. What does this win mean to the season and the program? SC: Although they are ranked just behind us, this is probably one of the biggest wins in our program’s history. I think that this is the first time we’ve beaten them in 47 years, and to do it so decisively is great for our confidence moving forward and really reinforces the belief that we can compete with and beat any of the top teams in the country. Getting this win also sets us on a great course for the NESCAC tournament, and qualifying for NCAAs which is really competitive among our conference. A: How is the team preparing for the upcoming schedule, which is almost certain to be get much more difficult than it has been to this point? SC: Our schedule is interesting because going into the second half of the season, as we’re playing all of the top teams in our conference away. It’s definitely a lot different playing at home and away, but again it’s important to control what we can control – I’m confident that our team will take it in stride and compete to the best of our abilities, taking every match as a learning opportunity and continuing to train our hardest and improve even with matches every weekend. A: Do you see the lineup as set in stone going forward, or is [head coach Mike] Fried still treating it as an active competition for spots? SC: While the lineup hasn’t changed a lot this season, our coaches put a lot of thought in the offseason and before each match towards creating a lineup they believe puts us in the best position to win. Obviously the lineup can change during the season and it has in the past – the coaches take a lot of factors into consideration when creating or changing the lineup. Since everyone is so good, sometimes just how someone is playing in practice that week or if someone is injured can influence the lineup. The lineup is always a tough situation as there’s only so many positions in each match, but I have full faith that our coaches are putting forth the lineup they believe gives us the best chance to win each match. A: How are you balancing what’s best for your individual postseason with winning matches now? SC: I’m really just taking one match at a time and trying to play my best and win every match for the team. We were so close to making it to NCAAs as a team last year and I’d love to make it this year. But it’s always a treat to make it individually, and I was lucky to qualify based on my results in the team matches last year. If I make it again this year, I hope to improve upon my results from last year.